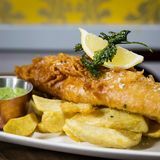 Part of the Davy's chain of wine bars, Habit is a traditional type of establishment with a contemporary edge, serving a range of classic British dishes on an extensive food menu. "Wine barrels and antique artefacts adorn this welcoming wine bar and dining rooms between Tower Hill and Aldgate tube. 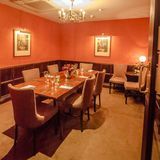 A number of different rooms and areas are available to book from small alcoves to a large boardroom. 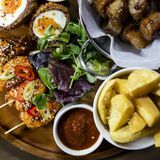 Menus are created using the best, freshest ingredients and drinks include craft beers and spirits as well as the extensive range of wines from Davy’s wine merchants, many of which are available by the glass." What did you think of Habit? I always go to Habit & New Waterloo Rooms when I'm in need of some good meat. Habit always serve up beautifully cooked steak in a lovely atmosphere - what more can you ask for really? This rustic basement wine bar near Fenchurch Street is blessed with an excellent cellar: well worth a visit, budget permitting. The Habit can be found on Crutched Friars, a short walk from Aldgate tube. A row of tables on street-level provide outdoor seating, but the venue is mostly situated underground, down a winding staircase decorated with display cabinets and vintage wine bottles. The main room has a distinctly traditional feel, with flagstones and white, wood-paneled walls framing a sturdy bar and all manner of wine bottles, glasses and paraphernalia. Barrels act as unconventional tables, and there is adequate seating room among the tastefully candlelit arrangements and antique books. Meanwhile, the “Grill Room” is tucked away behind the bar and discreetly concealed kitchen, capable of holding several dozen diners with dimly-lit red walls making for a pleasingly cozy atmosphere. There are also several alcoves and booths adjacent to both rooms, available for private hire. The Habit comes across as the more informal “younger sibling” of the City Flogger, another basement wine bar located on nearby Fenchurch Street, and also run by Davy’s. The atmosphere is friendly and relaxed, particularly after office hours, when the white-collar regulars descend before their commute home. The staff are knowledgeable and enthusiastic, and the restrained background music adds a nice touch. Overall the bar doesn’t feel too claustrophobic despite its underground location, and parties often tend to stay put all evening. 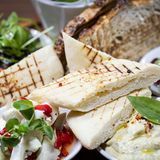 Although primarily a wine bar, the Habit nevertheless prides itself on good food as well, with the kitchens selection of 21-day-matured steaks (£16-£25) whetting the appetite in particular. Elsewhere, starters such as foie gras on toast (£10) are reassuringly decadent, and the conventional array of main courses are costly (£10-£20) but ultimately satisfying, not least the poached fillet of trout with chargrilled asparagus (£17.50). Leftfield tidbits such as quails eggs (£3), and kiwi posset (£5) on the dessert menu, punctuate an otherwise traditional menu which ticks all the right boxes. Don’t be put off by the monasterial name: the Habit has a tremendous selection of wines and champagnes on offer, often available by the glass (£4.25-£11) and fairly good value for money (£16-£100 per bottle, or approximately double for champagne) given the variety and rarity of vintages. The staff are more than capable of recommending a suitable match for your meal or indeed any other occasion. Beer and cider is limited to bottled Corona, Asahi, Budvar and Aspalls (£4-£5), while a range of ales is available on tap – there are also copious amounts of spirits and liqueurs (£5-£6.50) for those not in the mood for wine, as well as a wide variety of hot and soft drinks. Relaxed yet utterly devoted to good food and drink, the Habit is certainly worth a detour for wine enthusiasts in the City.